There was no update for the ETF of the month for the last two months because our last recommendation (TUR) continued to be the best performing ETF for that period. 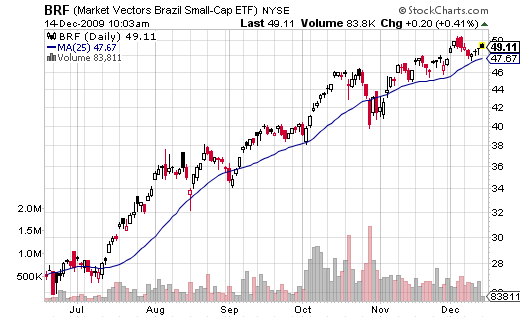 What are some of the best-rated ETFs that invest in global markets, as opposed to this month’s pick, which is focused on Brazil? Rich, global markets are not doing very well lately and looks like we are at the edge of a trend change. There is still isolated strength in markets like Brazil but the global indexes were all flat or down the last weeks. Jerry, I consider that 60 days it is more than enough to see if our service is what you are looking for or not. Most of our competition offer at maximum 30 days. Also, one single trade is not enough to test a system, it may happen that the trade you want to ‘test’ is our best (or worst) trade ever, will that tell you something about our system? No. You should probably start by checking our closed trades and if you decide to become a subscriber make sure you do it for a long enough term, start trading small amounts and increase only when you feel confident enough in our service.